What are the differences between the weBoost Connect 4G and weBoost Connect 4G‑X? Wilson Electronics separates the names of their two most popular home cell phone signal boosters with just one letter—X—but there are significant differences between the weBoost Connect 4G and the weBoost Connect 4G‑X in power, coverage and components. These products are separated by $350, which puts them in different price tiers. The Connect 4G‑X is Wilson Electronics’ flagship home cell signal booster, designed for larger homes that need greater signal coverage. The Connect 4G–X’s metal housing is more solid and durable than the Connect 4G’s plastic case. Both boosters receive power from a standard 110-volt wall outlet. The Connect 4G uses a 6-volt/2.5-amp power supply (the Wilson 850011), while the Connect 4G‑X uses a more robust 12-volt/3-amp power supply (the Wilson 859900). The Connect 4G has a maximum gain of +65 dB. The Connect 4G‑X has a maximum gain of +70 dB. Because the decibel scale is logarithmic, the Connect 4G‑X’s additional +5 dB of gain means it has over 3 times the power of the Connect 4G. The Connect 4G and Connect 4G‑X both have identical indicator lights on the front to indicate the amplifier’s status on different cellular frequencies. The Connect 4G booster attaches to its outside antennas with F connectors (the same kind used by cable and satellite TV systems), while the more powerful Connect 4G‑X uses commercial-grade N connectors. The Connect 4G uses two 30-foot lengths of consumer-grade RG6 coax cable, which is about ¼-inch in diameter. With a loss of −8.2 dB (on 800 MHz frequency) per 100 feet, that means cable is going to lose (attenuate) about −5 dB from the outside antenna to the inside antenna (−8.2 dB ÷ 100′ × 30′ × 2 lengths). The booster will increase the signal by up to +65 dB, so your net gain would be up to +60 dB. The Connect 4G‑X kit includes two lengths (75 feet and 60 feet) of commercial-grade 400 coax, which has a diameter of about ⁵⁄₁₆-inch. 400-type cable attenuates at −3.7 dB (on 800 MHz) per 100 feet, less than half the loss of an equal length of RG6. The total cable run for a Connect 4G‑X system is also going to lose about −5 dB (−3.7 dB ÷ 100′ × [75′ + 65′]). That’s the same loss as the Connect 4G, but with 75 more feet of cabling. The booster gain is up to +70 dB, so your net gain would be up to +65 dB. The net difference between the two systems seems insignificant, but keep in mind that when you add +6 dB of signal to a cellular amplifier, you have the potential to double its broadcast area. 400 coax cable is thicker and stiffer than RG6, which makes it more difficult to work with, but its performance is significantly better. In this feature, there is no difference between the Connect 4G and the Connect 4G‑X kits from Wilson Electronics. Both factory kits come with an outside pole-mounted directional LPDA antenna and an inside wall-mounted directional panel. 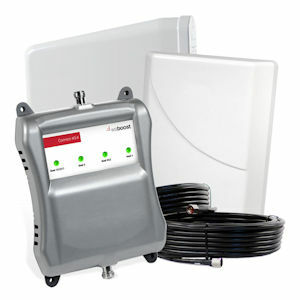 However, Powerful Signal is pleased to offer inexpensive upgraded kits for both the Connect 4G and the Connect 4G‑X that feature omnidirectional outside and inside antennas. 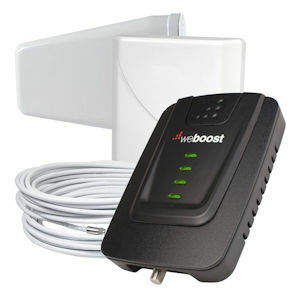 weBoost Connect 4G: 1 to 2 rooms, or partial coverage of a home. weBoost Connect 4G-X: entire coverage for small to large homes. The Connect 4G and Connect 4G‑X are both excellent system, provided they are used where they are designed to be used. The Connect 4G-X is more powerful and can cover more square footage than the Connect 4G; this means it can be used in larger homes (and even in a two‑antenna or four‑antenna configuration). The Connect 4G can cover one or two rooms of a home, and possibly more if there is strong outside cell signal. Generally, however, the Connect 4G‑X will cover more than twice the area of the Connect 4G under the same signal conditions.